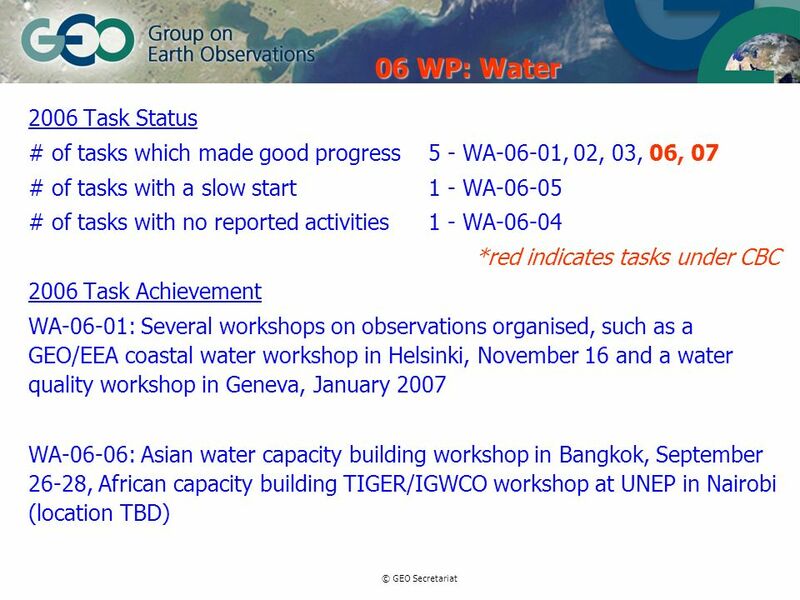 © GEO Secretariat Review of 2006 Work Plan Tasks Capacity Building Committee Meeting 15-16 September 2006 Brussels Imraan Saloojee & Datong Zhao GEO Secretariat. 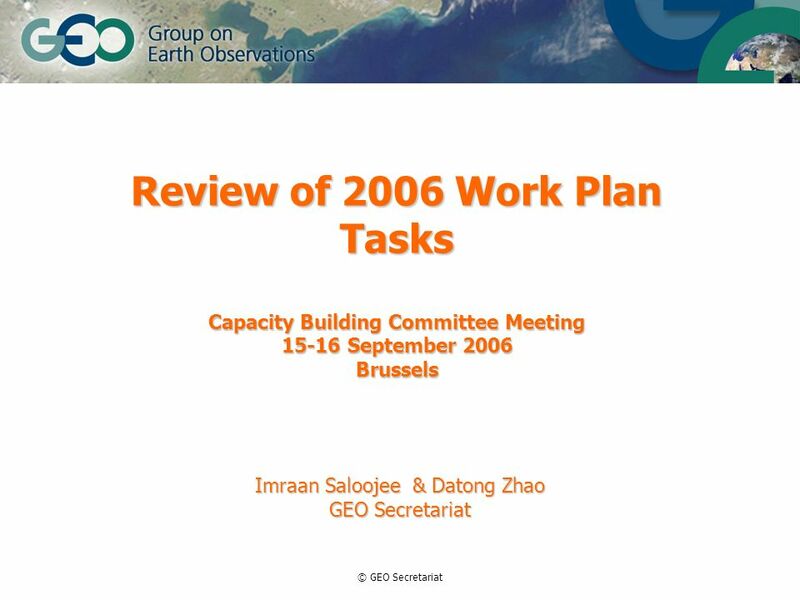 Download ppt "© GEO Secretariat Review of 2006 Work Plan Tasks Capacity Building Committee Meeting 15-16 September 2006 Brussels Imraan Saloojee & Datong Zhao GEO Secretariat." 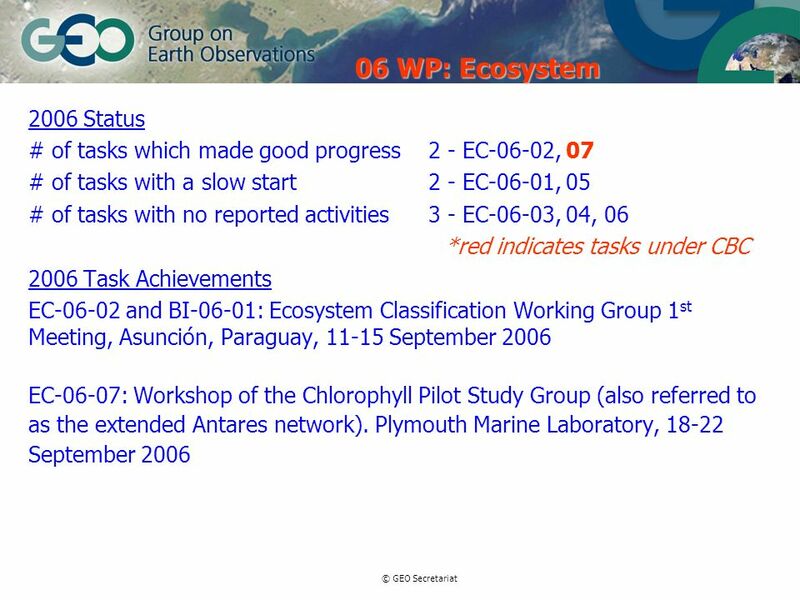 Projects & Applications Subgroup Osamu Ochiai and Pakorn Apaphant Budapest, Hungary May 11 th 2006. 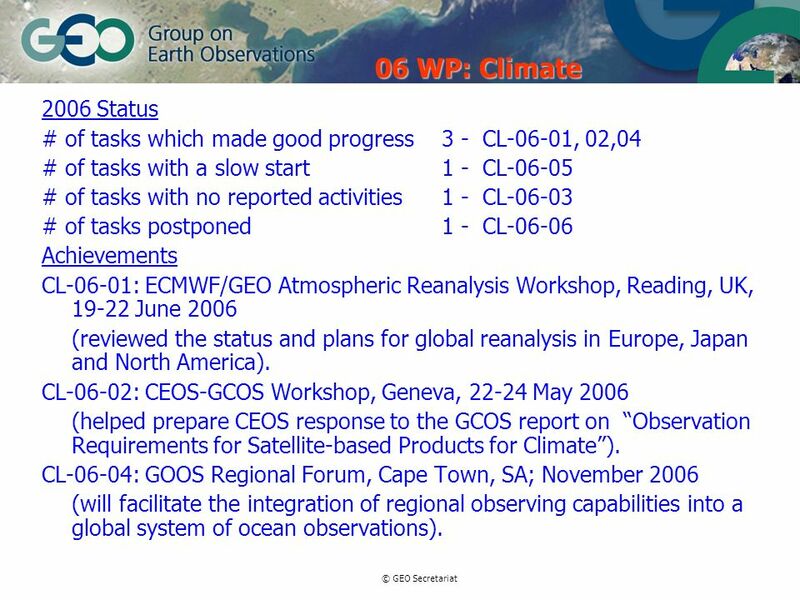 WGISS 1 WGISS-GEO Discussions Martha E. Maiden CEOS WGISS-24 Oberpfaffenhofen, Germany October 15~19, 2007. 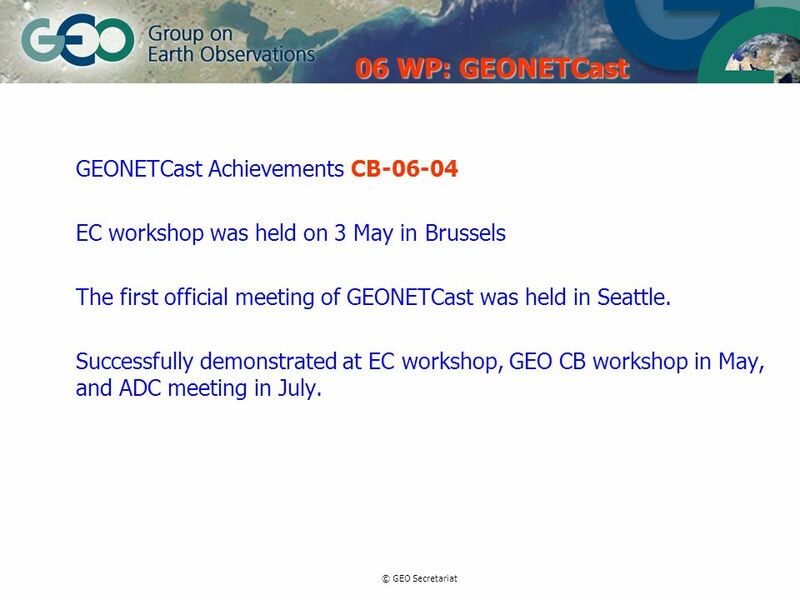 CBC 7 Report to June C4. 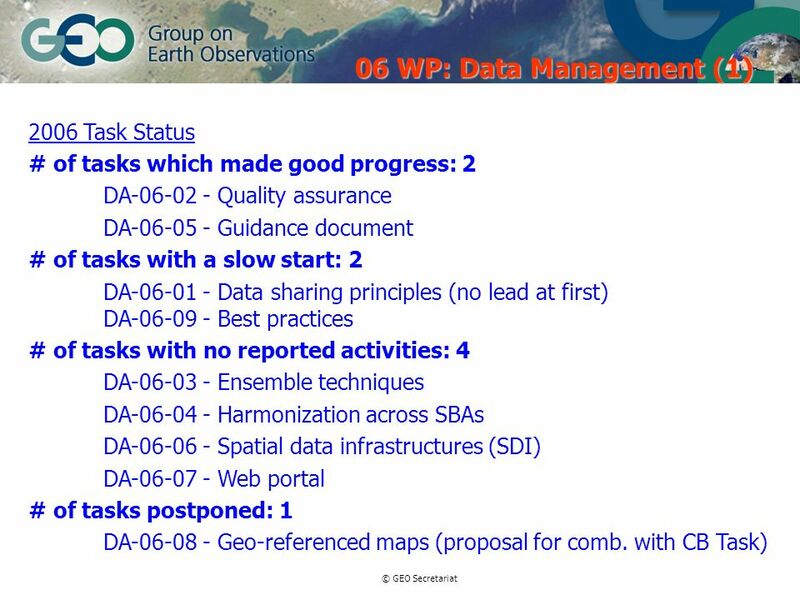 Discussions in Meeting Next CBC Meeting Coordination with Committees GCI Work Plan Progress Development of 2009 – 2011 Work Plan. 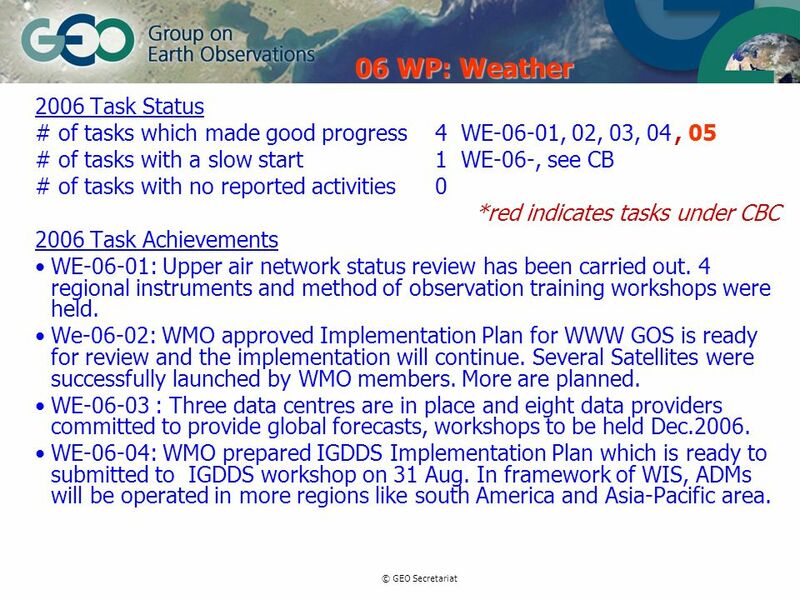 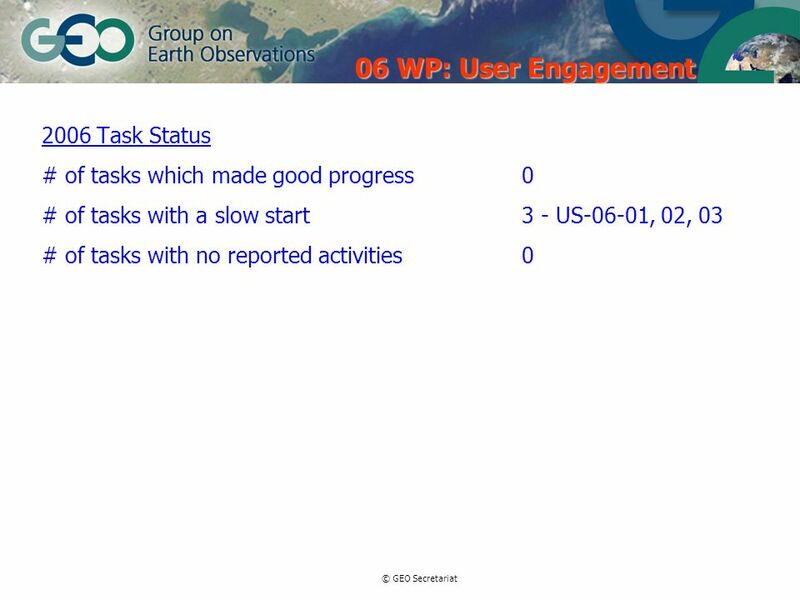 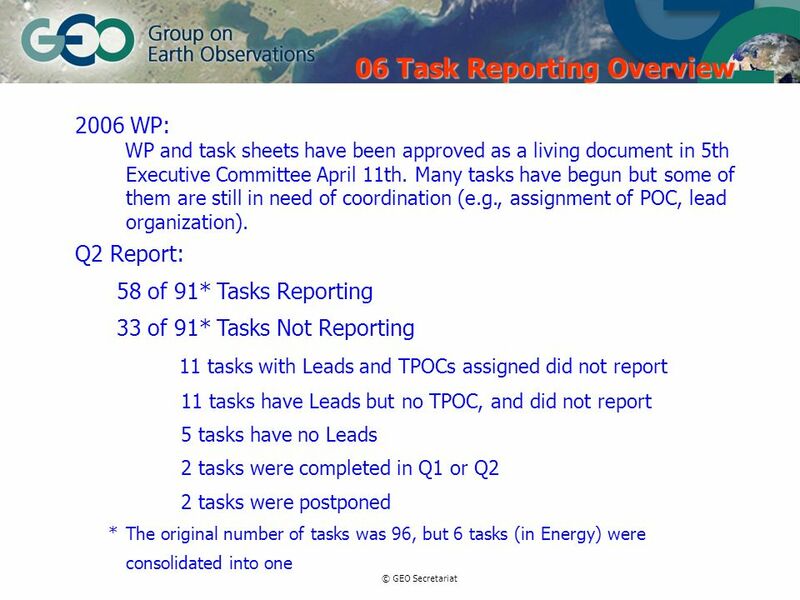 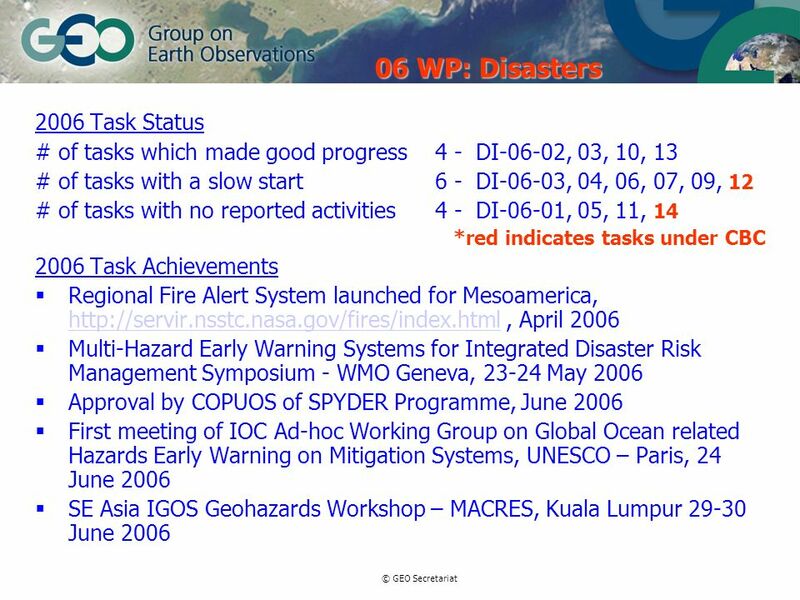 © GEO Secretariat Disasters SBA Status of Tasks DI-06-05, DI-06-06, DI New tasks proposed for the WorkPlan G. Rum - 05 September 2006. 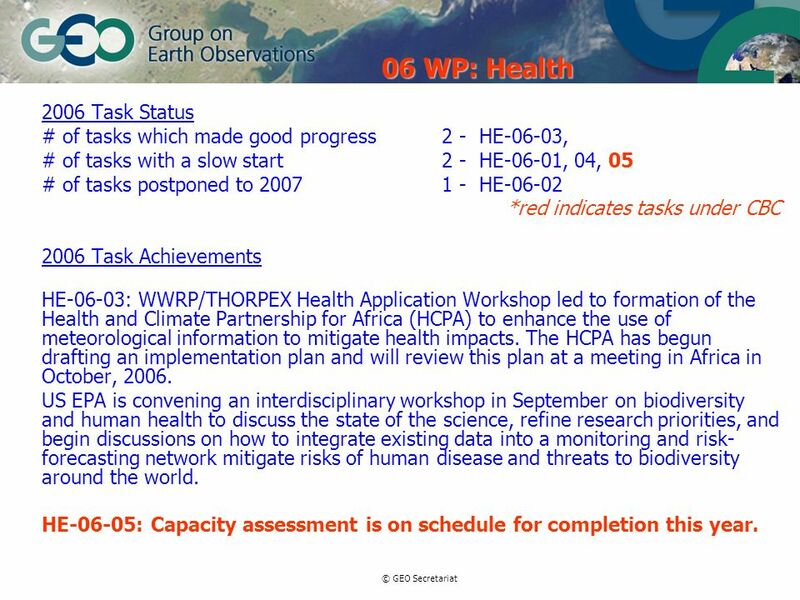 Overview of Capacity Building Committee Activities GEO Capacity Building Committee Meeting Brussels – 14 September 2006 Errol Levy DG Research – European. 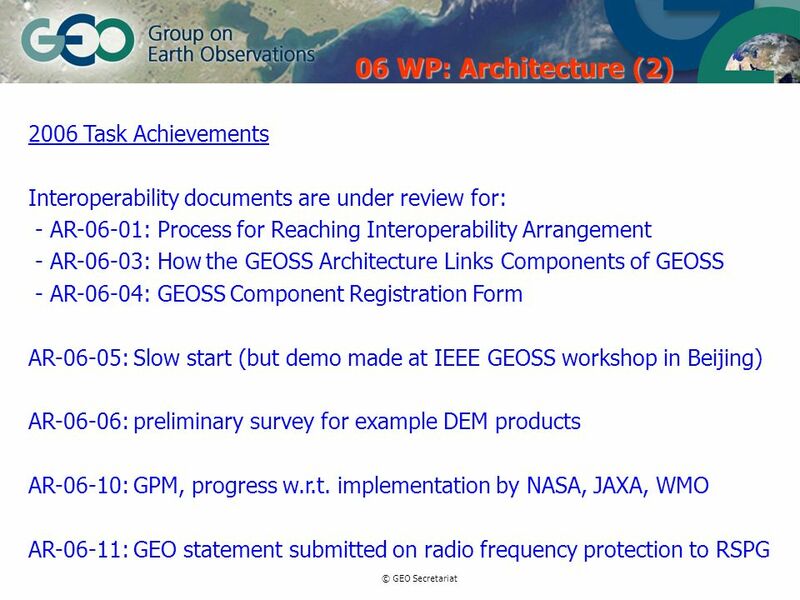 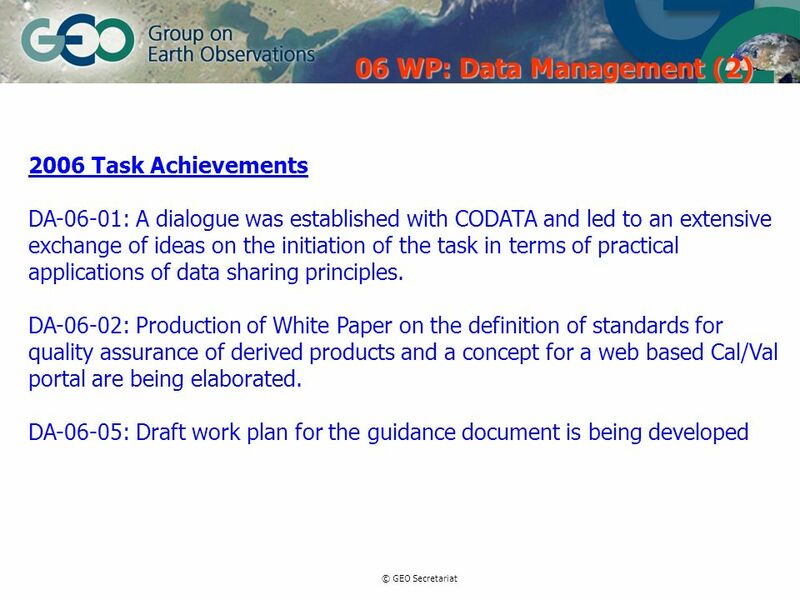 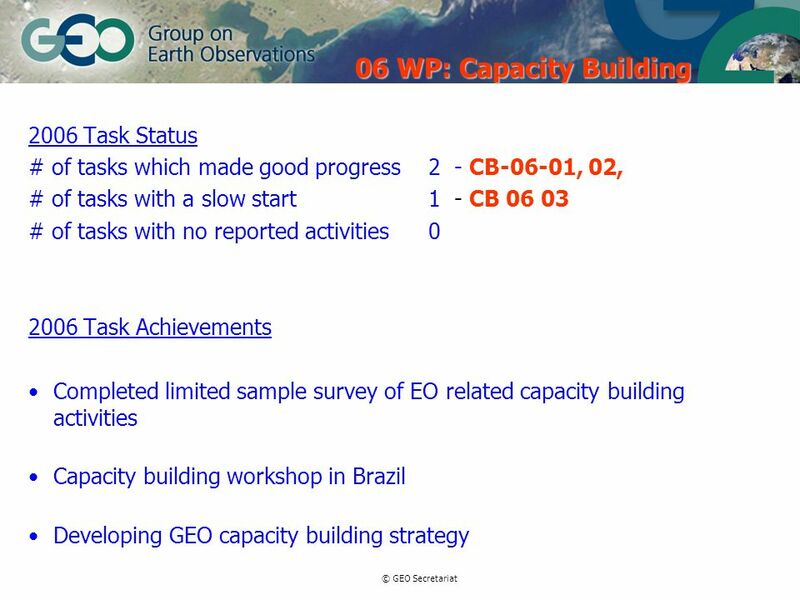 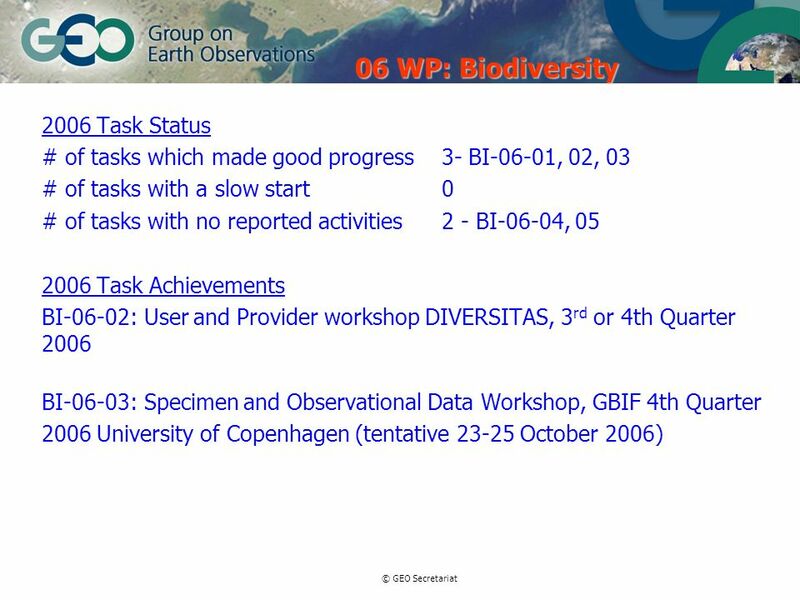 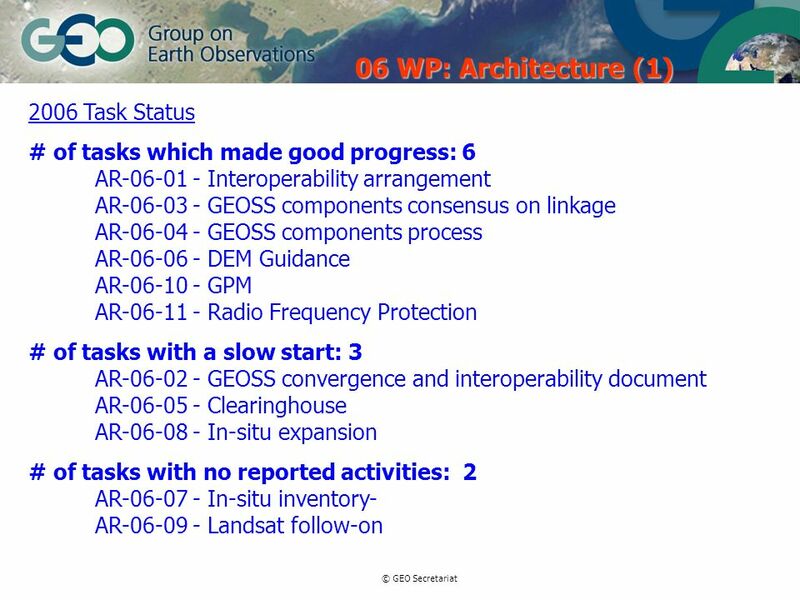 Group on Earth bservations Group on Earth bservations SGUR GEO-2 Baveno (I) November Presented by Ezio Bussoletti Draft GEO Framework, Chapter. 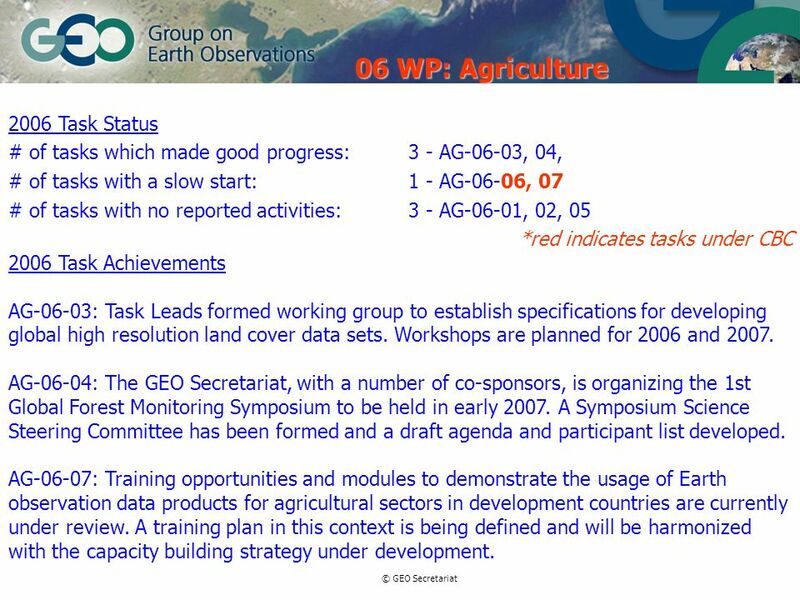 © GEO Secretariat GEO Secretariat Update Capacity Building Committee Meeting September 2006 Brussels Datong Zhao & Imraan Saloojee GEO Secretariat. 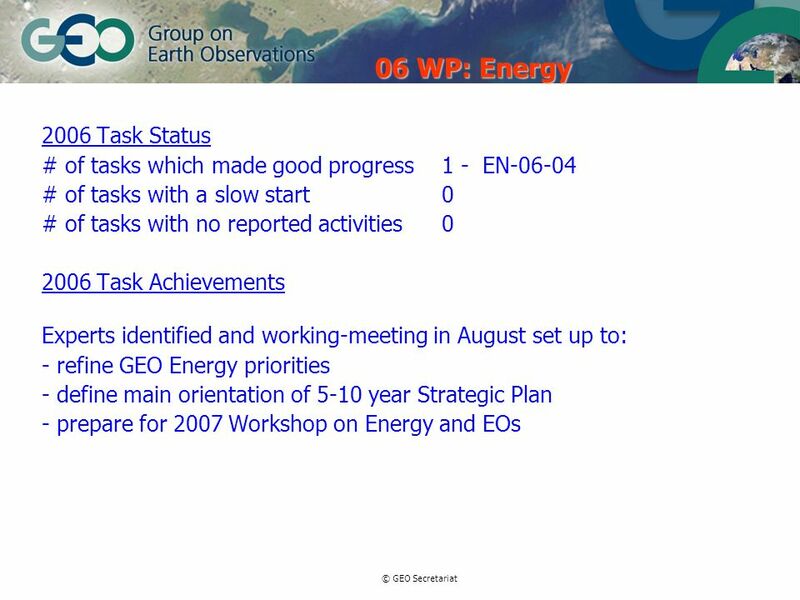 1 Guy Duchossois, Work Plan Manager Report on 2006 Work Plan.